“This is a key industry moment where two technically advanced companies with extensive experience can share technology for the sole purpose of providing our repair shops with the broadest forms of information available when making their repairs,” Celette President Pierre Nicolau said in a statement. Chief and Celette each have data for “thousands” of global vehicles, VSG’s own parent company Dover wrote in a Nov. 1 news release. “Through this alliance, they will leverage their individual data collection technologies and will share information so that both companies can expand their specification databases to provide maximum vehicle coverage to their customers,” Dover wrote. Some automakers might only rate particular bench systems as acceptable for their vehicles and refuse to share precise measurements with unapproved manufacturers. Asked how the database partnership would handle a situation where either Chief or Celette was approved by an OEM and the other company wasn’t, Vehicle Service Group global technical systems product manager Brent Johnson said exact OEM CAD files would not be shared. Merging the two competitors’ databases wouldn’t be redundant when examined on a global scale, according to Johnson. Johnson explained how the database would handle a scenario where the two companies’ measurement information varied. “Celette is proud to expand our market coverage by tapping into the impressive infrastructure and highly experienced representation of the Chief team in these important global markets,” Nicolau said in a statement. 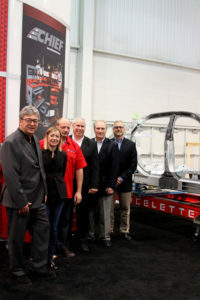 Dover highlighted Celette’s “host of OEM global approvals,” offering as an example the more than 60 OEM makes that have given a nod to the Sevenne bench. It said Celette’s portfolio would compliment Chief’s diverse catalog, which includes tools like welders, fume extractors and rivet guns in addition to measuring, pulling and anchoring equipment.